Welcome to our monthly update sheet, I hope that you find it useful. If you have any suggestions as to what you would like included please do let me know. (All contact details are at the bottom of the sheet). ​We have recently been hearing that some people with young children feel that 11:15 is the only service to which you can bring children. I just want to make it really clear to everyone that children are welcome at all of our services and if you prefer a more traditional service or you would just like to experience something different please do come along to either 8:00am or 9:30am and please do bring your children we love to have families worshipping together at all of our services. November 5th - No 9:30 or 11:15 Joint service at 10.00 where the children preparing for Communion will be making their First Communion. We hope to make this a real celebration for the children involved so please do come along and support them. In the meantime please keep Alex, Sarah, Elysia, Mason, Katie and Lizzie in your prayers. November 12th - No 11.15 service as it is Remembrance Sunday and we will be at the war memorial for 11:00am. There will still be a 9:30am service at which everyone is always welcome or alternatively do join us at the war memorial at the end of the High Street for the Remembrance Day service. Please remember that we do serve coffee between the 9:30 and 11:15 services. Please do join us and have a chat with other members of the congregation. If you have never been to Messy Church or haven’t been for some time and would like to try it please contact me and will make sure that you get the necessary information. I don’t know if you have heard of this organisation before but basically it is a group who encourage dad’s to be more actively involved with the Spiritual nurture of their children. 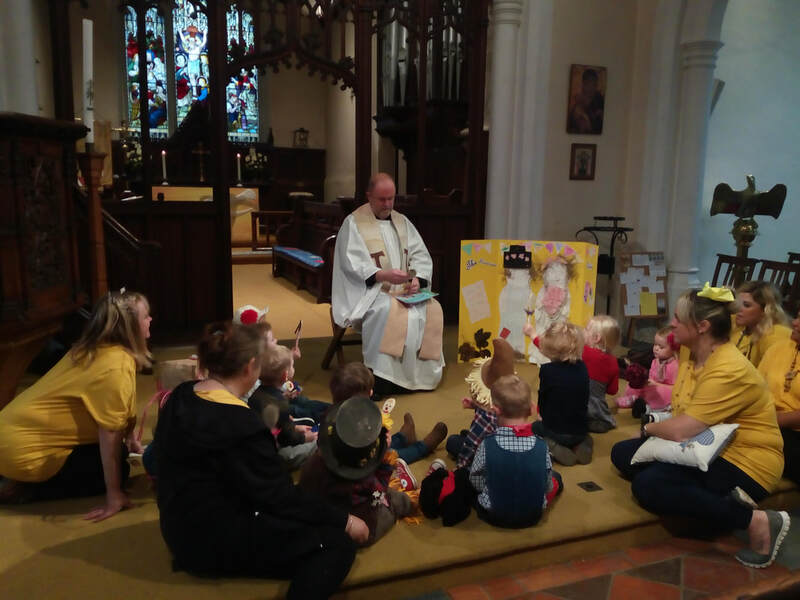 The most popular way of doing this is by organising a dad’s and children event probably on a monthly basis, running something like a cross between parent and toddlers and Messy Church, but run by dads and for dads. If you think this is something that you would be interested in organising or becoming involved with please do let me know. If there is enough interest we will look into the possibility of setting up a monthly group on Saturday’s at the Parish Centre. I believe the big draw is generally the bacon butty’s that seem to be obligatory! If you would like to have your child baptised here at St Nicholas, or if you would like to be baptised yourself, baptism is open to people of all ages, please come along to vestry hour in the church on Monday evenings 6.30-7.30 (except bank holidays) and speak to a member of staff. Many thanks to everyone who has come along to a service to pick up their baptism certificate we still have quite a number waiting to be collected. We do appreciate that it is not always easy to get here on a Sunday but we do feel that it is extremely important that if baptism is to mark the beginning of a life long journey with Christ then they do need to be welcomed by the local Christian community and we do this when we give the baptism certificate. I do hope that you have found this information helpful. If you would like any further information please do get in touch, we love to hear from you. 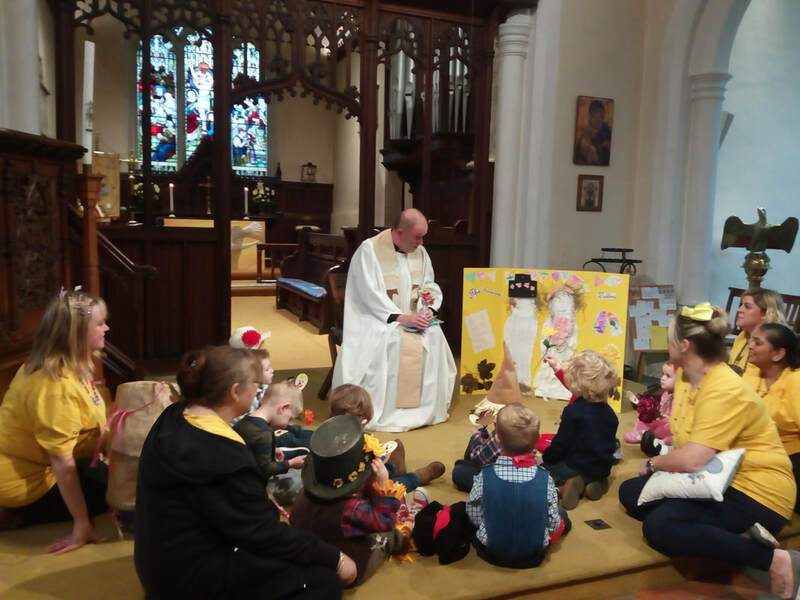 Photos - Courtesy of Roseacre Nursery, showing the recent 'Scarecrow Wedding' held in the church.